Summer is winding down here, but the heat still lingers. So we need to sip something cool and refreshing. Like The Gin Daisy. Its crisp taste is ideal for an afternoon by the pool, or as a predinner drink. And here in the US, the long Labor Day weekend is approaching. Daisy would love to be invited to your annual cookout. A “daisy” is a type of mixed drink (in the same way that the julep, fizz, and Collins are specific drink types). It dates back to the 19th century, when it was quite popular. Today we call all mixed drinks “cocktails.” But the flowery moniker lives on in this drink. You can make a daisy using any base spirit, plus citrus (usually lemon juice), sweetener, and fizzy water. 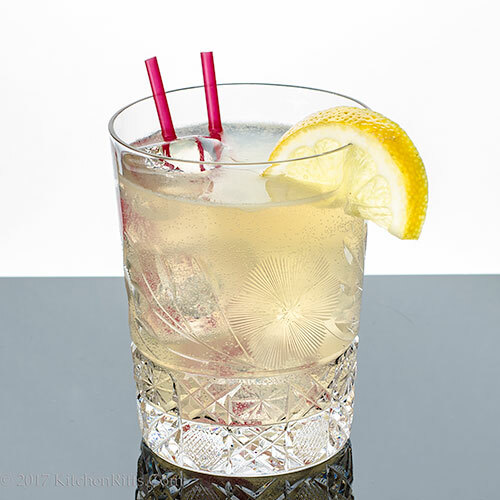 In the past, we’ve made the Rum Daisy, which uses grenadine as the sweetener (along with a minimum of fizzy water) and is served “up” in a cocktail glass. That recipe reflects the modern method of making a daisy. Originally, however, the daisy contained orange curaçao (plus a bit of sugar) as the sweetener. It was served over ice in a rocks or Collins glass, and contained more fizzy water — making it a more voluminous drink than the modern version. Because we have a thirst to quench this time of year, we’re making our Gin Daisy the old-fashioned way. For more history about daisies (and all types of mixed drinks), we recommend Imbibe! by cocktail historian extraordinaire David Wondrich. Our recipe is adapted from his. Fill a cocktail shaker half full with ice. Add all ingredients except fizzy water and garnish. Shake until well chilled (about 20 seconds). Strain into a rocks or tall (Collins) glass filled with ice cubes or crushed ice (use a glass that holds 8 to 10 ounces). Top with fizzy water. Stir briefly, add garnish if desired, and serve. Prefer to serve this drink “up”? Just strain the contents of the shaker into a cocktail glass, then add only ½ ounce of fizzy water. If you find this recipe a bit too sweet, reduce the amount of Grand Marnier to 3 teaspoons, and the simple syrup to a teaspoon or two. You can find generic orange curaçao at any liquor store. We generally use Grand Marnier, which is a premium curaçao. It has excellent flavor (and we always have it on hand). As noted above, you can make a daisy using almost any base liquor. Brandy daisies, for example, were once very popular. When making a brandy daisy, some bartenders like to substitute yellow Chartreuse liqueur for the orange curaçao and sugar. BTW, if you make a daisy with tequila – and skip the fizzy water – you basically have a Margarita. I have never heard of the term daisy for a drink before but glad of the discovery. I assume not he blue orange curaçao was in favor lol. I second the bigger glass the old fashioned way. Thanks for sharing! Hi Evelyne, back in the day a "cocktail" was a specific sort of mixed drink; as were daisies, juleps, etc etc. Easier just to call all mixed drinks cocktails! Thanks for the comment. Hi Tricia, have a daisy, do, so you don't go half crazy. :-) Thanks for the comment. I absolutely loved the sound of this cocktail, John. I am sure I would enjoy this gin daisy. Wonderful recipe. Hi Anu, this has a refreshing flavor -- very good. :-) Thanks for the comment. The daisy is one of my favorite flowers. Perhaps it should become one of my favorite drinks. I don't think that would be a problem! The daisy sounds like my kind of cocktail. And perfect for the holiday weekend! Hope you and Mrs. KR have a wonderful long weekend. Hi Abbe, the daisy is an outstanding drink (flower, too) -- this could become your new favorite. :-) Thanks for the comment. Hi Greg, crushed ice IS traditional for this drink. Doesn't really work for gin, IMO. 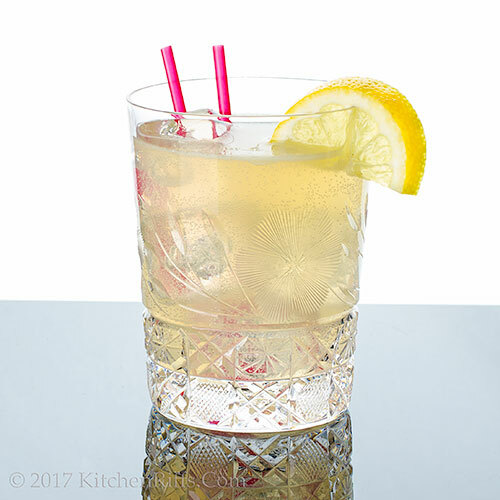 I do like crushed ice in rum drinks like a Mai Tai -- but as often as not I'm putting a float of Lemon Hart 151 on top to give the drink some extra oomph when I get down to the watery part of the drink. That's not traditional at all, but it works. :-) Thanks for the comment. Hi Liz, it's a great weekend drink! Thanks for the comment. This sounds like a very refreshing cocktail John. It is still hot here in Florida and this sounds like a nice drink to have over the holiday. Thanks! Hi Karen, this would be a refreshing drink almost every month of the year in Florida! :-) Thanks for the comment. The daisy appeals to me, though 2 oz of gin plus Grand Marnier seems pretty alcoholic! I used to drink liqueurs like that more than I do now; I should regress! Hi Mae, regression can be good. :-) Thanks for the comment. Well this is a drink I think I'd like! Trust me, I love to drink, but I just don't like super strong drinks like martinis. Labor Day sounds perfect. Crazy good photos as always! Hi Mimi, make this in a tall glass, add a bit more fizzy water, and you have a nice, slow sipper of a drink. Thanks for the comment. This gin daisy cocktail sounds like something that I would enjoy sipping on. Nice and refreshing. Hi Dawn, it's very refreshing! Good flavor, too. :-) Thanks for the comment. Lingers. HA - THE HEAT IS LIKE "HEY, I HAVE MOVED IN FOR GOOD, HAVE FUN WITH ME!"... And I am like "UGHHHHHH I NEED TO MOVEEEEE!!!" - haahahah! Or perhaps I need to this drink to forget how sweltering it is outside. Oh this is a YYyesss for me, I know Daisy would love to come to my next party. Before I gave up the alcohol, gin was definitely a favourite. Beautiful shots and I love that glass, John. Love the name of this one, John. Would you believe I tasted gin for the first time in my life just last week!? I wonder if they know what a gin Daisy cocktail is here in Europe. I have to find a fancy bar. HiGiGi, hot enough for you? :D LA does get rather warm, doesn't it? But this drink will cool you off! Thanks for the comment. Hi Anna, Daisy is looking forward to your next party! :-) Thanks for the comment. Hi Angie, that glass is an antique -- at least 100 years old. Worthy of Daisy, don't you think? :-) Thanks for the comment. Hi Liz, wow, you have a lot of catching up to do! There are a LOT of really good gin cocktails out there. Thanks for the comment. Hi Gerlinde, a good bar probably would, particularly in England and France (a lot of famous bars in London and Paris). Not so sure about Germany. Thanks for the comment. Hi Sue, next time she gives you a hard time, just serve her this drink. And she'll start giving you a hard time for NOT naming her Daisy! :-) Thanks for the comment. The only thing I have ever heard from anyone I know is how much they hate gin, but I am dying to try it. This sounds like the perfect way to ease in with the fruity, sweet flavors. Hi Laura, this drink really would be a perfect intro to gin. Or maybe a Tom Collins. A lot of people don't like gin because they had an unfortunate experience with it when they were young, and still haven't gotten over it. :-) Thanks for the comment. It's so cold here this week - feels like October! I could still go for one of these delicious looking cocktails! Hi Ashley, wow, a bit early to be quite that cold where you are! Must feel nice, though -- looking forward to cooler weather. :-) Thanks for the comment. 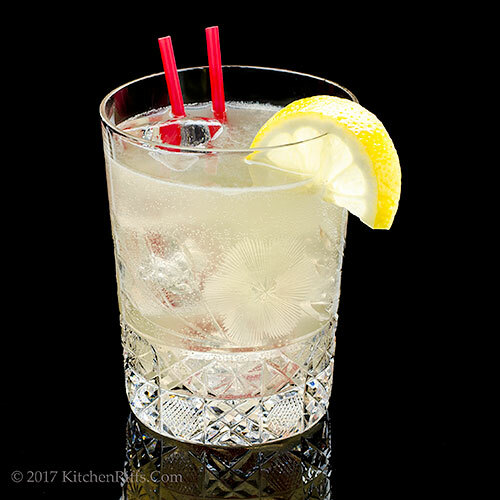 The ideal cocktail to celebrate this long holiday weekend! Cheers! That would taste mighty good right now. It looks and sounds terrific John. Hi Denise, cheers! :-) Thanks for the comment. Hi Pam, it IS terrific! :-) Thanks for the comment. Heading into a heat wave this holiday weekend. Sipping on a gin daisy would ease my mind and make the heat seem inconsequential. 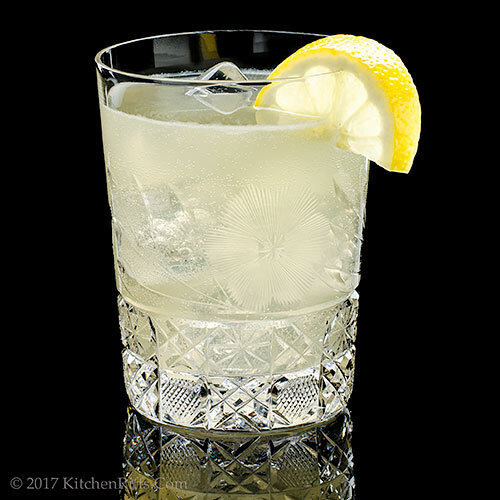 The fresh lemon juice really adds brightness to this cocktail. Hi Deb, this definitely helps chase the heat away! Thanks for the comment. Hi John, this gin daisy sounds refreshing and the perfect drink for this time of year. Wishing you and Mrs. KR a wonderful week-end. Hi Cheri, this really is a lovely end-of-summer drink. Or for anytime, really. :-) Thanks for the comment. Daisied and confused, jaja, it happens when drinks 'go down smooth'. Never heard of the daisy, but it has all ingredients I like. The grenadine reminded me of my childhood, there were hardly soft drinks at home, and they gave us grenadine syrup with water! Good week John! Hi Raymund, this really has nice flavor -- you'll like. :-) Thanks for the comment. Hi Paula, grenadine and water makes a nice mocktail! :-) Thanks for the comment. I'm grabbing a lemon on the way home this afternoon, and mixing up a few of these! This cocktail sounds like something I would like! Hi Jeff, I'd grab several lemons -- you might want these again tomorrow. :-) Thanks for the comment. Hi Peachy, it has a nice refreshing taste -- I think you would enjoy this. :-) Thanks for the comment. I'm embarrassed to say that I literally just had my first Gin & Tonic recently at a party and loved it. Kind of reminded me of limeade. So refreshing! That's been my new drink, when I drink which is hardly ever. Now I'll have to try this, it sounds yummy! Any particular brand of Gin you recommend since I'm not an expert on liquor? This looks like my new go-to summer cocktail. I am so into gin lately. And I love how simple this is to make. Hi Vicki, the flavor of gin does vary a bit from brand to brand (they use different botanicals), but our favorite gin for mixed drinks is Beefeater. Plymouth is another good brand that has a lighter flavor, which you may prefer. If you like a G&T, you should also try a Tom Collins and a Gin Rickey. And this drink, of course. :-) Thanks for the comment. Hi Carolyn, you'll like this! Wonderful flavor. :-) Thanks for the comment. This drink sounds so refreshing with all the citrus flavors! Perfect for a hot day. Hi Amy, love citrus flavors! Particularly lemon, so this drink is a favorite. :-) Thanks for the ocmment. Hi Frank, always important to experiment. :D Thanks for the comment. This looks like a nice refreshing cup of lemonade :). Looks so tasty and thirst quenching drink. The best way to say goodbye to summer! I will try to make this as I have all the ingredients handy at home! Hi Anne, this really is a refreshing drink. And it tastes SO good! :-) Thanks for the comment. Hi Amira, this basically is lemonade. With a kick, of course. :-) Thanks for the comment. Hi Katerina, you'll enjoy this! :-) Thanks for the comment. Hi Bobbi, G&T's are wonderful, aren't they? As is this! Thanks for the comment. I love gin, it's my go to drink and this sounds like a great way to drink it. Hi Emma, this is really refreshing. And good. :-) Thanks for the comment. What a delightful cocktail! I'll have to try it once (first I need to buy Grand Marnier). Hi Rosa, this is SO refreshing with wonderful flavor -- you'll enjoy it. :-) Thanks for the comment.